The online technology built into VIP allows students’ work to be closely monitored by teachers. 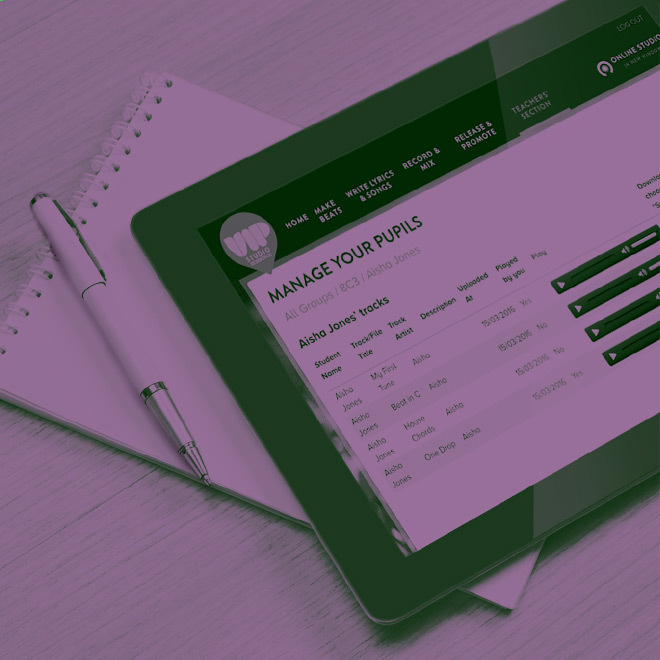 We’re loving VIP at Stewards Academy, particularly because the pupils can use it at home and teachers can monitor their progress remotely. It’s a great stepping stone to professional production software used in the industry so it helps prepare them for future opportunities. VIP is easy to use and the tutorial videos are an added bonus. As work is saved, teachers can review pupil by pupil and provide direct online feedback on each composition, which then allows the pupils to revise and improve upon their songs straight away. Teachers can also see the times and duration spent on the site, giving a snapshot of who is using VIP and which students may need some one-to-one time, etc. This technology also solves the time-consuming impracticality of digital music in schools, where work used to be saved in documents in the school’s network or on a series of memory sticks. Now teachers can log in from anywhere to assess and track students’ progress.